Thank you for believing in, supporting, and inspiring us to continue infusing the strong programs of the OAFP Foundation with fresh ideas that help us more fully achieve our mission. It is only through you that we can advance our commitment to family medicine and the people we serve. In 2018, the Ohio Academy of Family Physicians celebrated its 70th anniversary. 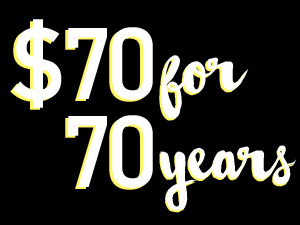 In honor of the Academy’s anniversary, the OAFP Foundation asked everyone to join in on the celebration by making a $70 tax-deductible contribution to help insure that the specialty of family medicine continues to thrive for another 70 years. Thank you to those that contributed! We also know that providing a variety of ways to give is important. Listed below are additional ways you can give whether monetarily or in-kind. Through your planned gift, you can support the Foundation and its programs. A planned gift provides one of the most substantial and lasting means of support you can give. Planned gifts require specific planning with your financial advisor, attorney, or accountant and can provide you, the donor, with significant tax advantages. You can make a planned gift to the Foundation through a bequest (a gift you designate in your will), living trust, gift of life insurance, or a variety of other options. What better way to support the future of family medicine in Ohio than to name the Foundation in your will and in your estate planning. None of us knows what the future will bring. What we do know is that people will always need the quality care provided by family physicians and family physicians will always need to have meaningful involvement with both their patients and communities, making lasting improvements in Ohio’s quality of life. You can make the Foundation a beneficiary of your life insurance, pension plan, or IRA. The Foundation established the Family Medicine Legacy League to recognize those who make provisions through their estate. Donor recognition is given for any gift made by bequests, life insurance, charitable remainder trust, or any other type of planned gift. If you have remembered the Foundation in your will, please let us know so that we may properly recognize your generosity by listing you as a member of the Family Medicine Legacy League. While public recognition of your gift often inspires generosity in others, we also understand that anonymity may be your preference. Please contact Director of Foundation & Strategic Programs Kaitlin McGuffie or call 800.742.7327 for more information. The AAFP Foundation also has financial and estate planning tools to help make the critical task of estate planning even easier for donors with the user-friendly planned giving section of its website. The AAFP Foundation staff is available to help interested donors who wish to remember both the AAFP Foundation and the OAFP Foundation in their charitable bequests. For more information, contact the AAFP Foundation or request a free Wills Guide. When you make provisions for a planned gift to the AAFP Foundation, you become part of the AAFP Foundation League. The Foundation is a registered charity with www.iGive.com; and, shopping online at www.iGive.com is another way to support the Foundation’s mission to cultivate student career choice in the specialty of family medicine. By signing up at www.iGive.com/OAFPF and shopping online at the 900+ participating retail establishments, a percentage of your purchase(s) will be donated to the Foundation – and your shopping donations are tax deductible! “For online shoppers, this is a great way to make an extra contribution to the Foundation. It is fast, easy, and fun to watch your donations grow just by shopping online at your favorite stores,” said Foundation Executive Vice President Ann Spicer. Merchants associated with iGive are not remote, online “trunk stores,” but rather they include retailers such as Amazon, Macy’s, The Home Depot, Bed Bath and Beyond, Expedia, Orbitz, Barnes & Noble, Staples, QVC, JCPenney, and many, many more. Try it now! Join iGive and you will be setup to support the Foundation with your online shopping. It is that simple! The Foundation is a registered charity with AmazonSmile. Shopping through AmazonSmile is another way to support the Foundation’s mission to cultivate student career choice in the specialty of family medicine. AmazonSmile is a simple and automatic way for you to support the Foundation every time you shop, at no cost to you. When you shop at smile.amazon.com, you’ll find the exact same low prices, vast selection and convenient shopping experience as Amazon.com, with the added bonus that the AmazonSmile Foundation will donate 0.5% of the purchase price from your eligible purchases to the Foundation. To shop at AmazonSmile simply go visit the AmazonSmile website from the web browser on your computer or mobile device. You may also want to add a bookmark to AmazonSmile to make it even easier to return and start your shopping at AmazonSmile. You will be asked to select the organization you’d like to support. Enter The Ohio Academy of Family Physicians and you’re all set. You can also link your existing Amazon.com account on AmazonSmile. For more information, please see the program details on the AmazonSmile website. Each quarter, the Foundation hosts an online auction for members, friends, and the community to bid on a variety of items. Items have ranged from handmade wooden pens and wine stoppers to artwork, and event tickets. The Foundation continuously seeks items for this activity. If you’d like to donate an item to be placed up for bid, please contact Director of Foundation & Strategic Programs Kaitlin McGuffie. Each March, June, September, and November, keep an eye out for articles in the Weekly Family Medicine Update on how you can bid on that quarter’s item. 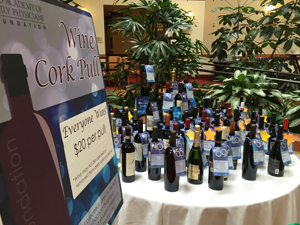 In 2012, the Wine Cork Pull was introduced as part of the Foundation’s 25th Anniversary celebratory activities and was a huge success and continues to grow each year! 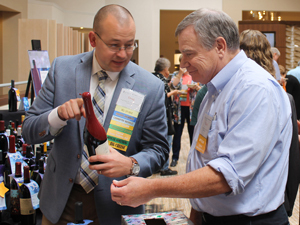 Each August during the Academy’s annual meeting, individuals can purchase a wine cork for $20 per chance and have the opportunity to win from a variety of bottled wines valued from $20 and up – there are no losers in this game! Even if wine is not your drink of choice, bottles make very nice gifts! Donations of wine for this event are needed each year. Our goal for this year is to get over 100 bottles of wine. Will you help us meet our goal? The value of the donated wine is considered a tax-deductible charitable contribution with all proceeds directly benefiting Foundation programs. To donate wine, complete the donation form and send it to Director of Foundation & Strategic Programs Kaitlin McGuffie by faxing it to 614.267.9191, emailing it to kmcguffie@ohioafp.org, or mailing it to 4075 N. High St. Columbus, OH 43214. A tradition of fundraising for Foundation programs through an annual quilt raffle was begun by Diane Todd and the OAFP auxiliary members in 1990. In 2000, a new twist on this tradition was introduced when OAFP Past Presidents Mark Belfer, DO; Ross Black, II, MD; and Mary Jo Welker, MD; sponsored the purchase of the quilt so that all raffle proceeds would benefit the Foundation’s programs. This tradition has grown each year as more past presidents join in sponsoring the quilt raffle. If you have any questions, please contact Director of Foundation & Strategic Programs Kaitlin McGuffie or call 800.742.7327. According to a 2015 survey from the American Academy of Family Physicians, of fourth-year medical students who were AAFP members revealed that 93% of respondents who matched into family medicine residency programs said strong family medicine mentors influenced their specialty choice. Conversely, of those who didn’t match in family medicine, only 60% said they had a strong mentor in the specialty. Mentors and preceptors are key to securing the next generation of family physicians. Medical students need positive family medicine preceptors early in their medical school career to engage with them in their journey and provide them with insight into the family medicine specialty they may not otherwise receive. However, we understand that making the choice to become an engaged preceptor may seem daunting and come with a lot of questions like: What information should I share? What procedures should I share? How will I make time in the day to see my patients and train a medical student? How will this disrupt the practice and other team members? And the list can go on. With all of these questions in mind, the Foundation has created this dedicated section to provide our preceptors with helpful information to be a successful preceptor. This list of resources will continue to grow so please return often for updated links and information! If you’re ready to jump in and train the next generation of family physicians and participate in the Foundation’s Leroy A. Rodgers, MD, Preceptorship Program to share four weeks during the summer months with a first or second-year medical student, please complete the Volunteer Preceptor Form and return it to Kaitlin McGuffie. Preceptor Development Summit – April 3, 2019, in Grove City, OH, from 9 a.m. – 1 p.m. The OAFP Foundation is always looking for individuals to join its Board of Trustees. Trustees are elected annually through a nomination and selection process with the Foundation’s governance committee. Trustees serve an initial three-year term and can be re-elected to serve a second, three-year term. Check out the Leadership Team page to learn more about the Board and the trustee responsibilities. If you are interested in serving on the Board of Trustees, please contact Director of Foundation & Strategic Programs Kaitlin McGuffie or call 800.742.7327. Share your story – plain and simple. Students and residents need to hear more from family physicians about the breadth of work they do and the satisfaction a career in family medicine can bring. Whether you’re having conversations with peers and colleagues or visiting students and residents, share the things you love about what you do. If you’d like to speak more formally with a family medicine interest group at one of the seven medical schools, please contact Director of Foundation & Strategic Programs Kaitlin McGuffie or call 800.742.7327. Ms. McGuffie can help coordinate this opportunity with you and the student group. Because of engaged volunteers like you, the Foundation Is able to play a role in increasing the family medicine pipeline in Ohio. Whether by donating funds or time, individuals like you are making a difference. 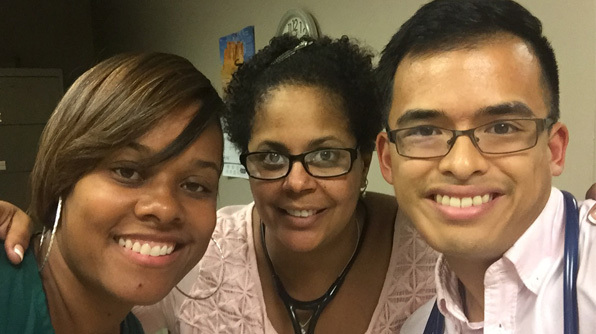 Seventy-four percent of students that participate in the Leroy A. Rodgers, MD, Preceptorship Program choose primary care!